The heat of spring and summer always calls for cool palettes of blue-greens, aquas, and teals. But how about the citrus colors? Think “a roll of lifesavers”: tangerine, lemon, lime, orange, grapefruit (writing the words makes my mouth water). A fresh palette that captivates with its warmth and vitality. 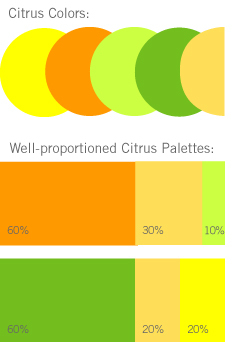 Try citrus colors in their pure, saturated versions, or tint them up with a little white.